Solid Sterling Silver Ladies Continuity Celtic Wedding Ring. Excellent Quality. Made in Dublin, Ireland. 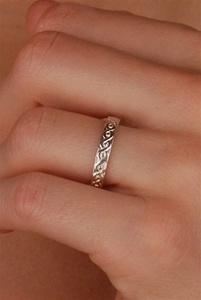 This is an authentic Celtic Wedding Ring made by master artisans. Measurement: 5.0 to 5.1 mm wide. Available also in 14K Gold. Available sizes 4 to 11 with half size increments. It is handcrafted in Dublin and hallmarked in the Assay Office located in Dublin Castle. Delivered as promised and my girl's loved the rings! I was very please with the quality of the ring and the fast delivery.